All change...changing a hairstyle (which is why mine hasn't in 15 years! ), kid's going off to college (dang near killed me), losing weight (still going slow but steady)...and then the ever dreaded "decor" changes. I know I need to make a change...it's all the decisions that go into it that get me every time. 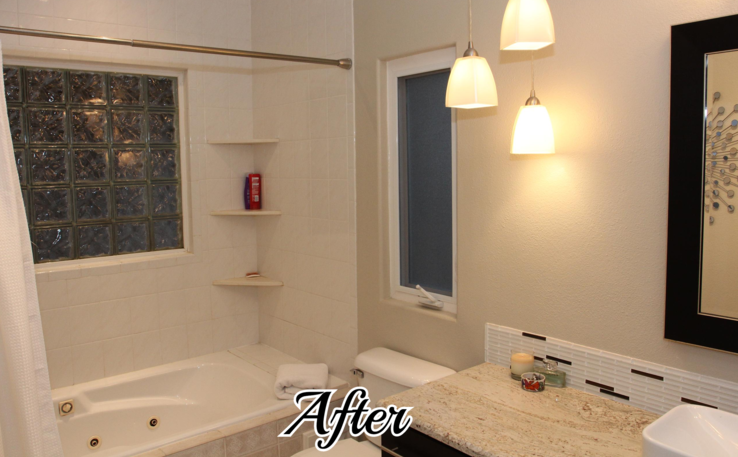 Take my master bath for example. I NEED to make a change...specifically, remove the whirlpool tub that hasn't been used in decades and put in a walk in shower. We need to do that now while we can still walk upstairs to use the other bathroom during the reno. If we wait until we break a hip, we would just have to sit around and smell for a few months. Not a good plan. Years ago I replaced my carpeted stairway with hardwood...I did it knowing there would come a day when I would not want (or be able to) drag a vacuum up and down the stairs. As much as I now dislike the color of the wood stain, I am grateful I made the change when I could...because dragging a vacuum up and down the stairs just isn't something I would want to do on a regular basis. So where do I start. I outlined that process here a few years ago when I changed up my den a bit. I love the "river rock" look and I like the "light and bright" of the white tiles. I found some other "inspirations" I like but most have painted cabinets. I MIGHT change my doors to a shaker style and paint the vanity a lighter color...might...maybe...we'll see. But for now I am planning around the darker "modern" style vanity that is there. 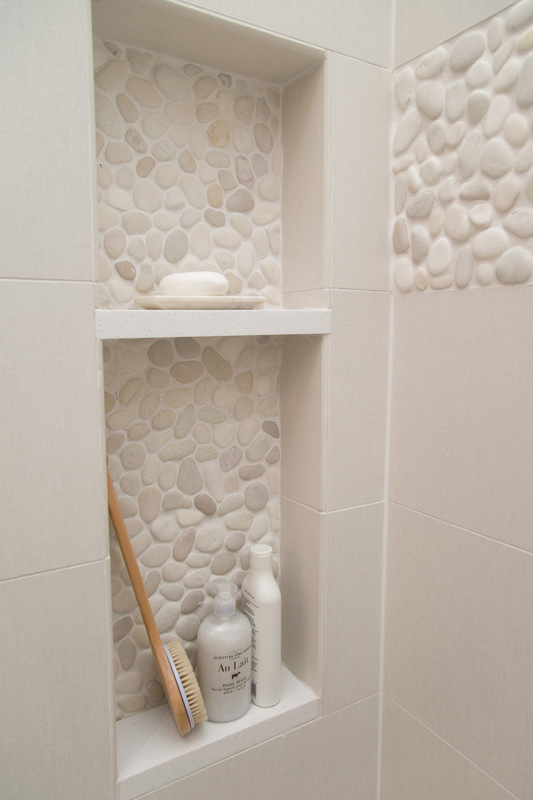 So really the wall tile (large white subway) and the shower floor and niche accent tile (pebble) are pretty easy choices. What is hanging me up is the floor tile. As I said before, I like the tile choices I made 19 years ago. Not really liking the ole' 12x12 with a 1/4" grout line that was popular 19 years ago, but I like the color and the texture of the tile itself. And I have ordered a few more online...so we'll see! Hopefully I can make a decision in the next week. I am actually hiring this done so I am meeting with two contractors this week for bids. My half bath hasn't had a real "makeover" in years. So I was thinking I might want to change it up a bit...I'm just kind of "bored" with it. It is a tiny space and wouldn't take much to change it up! But truthfully, I still like the color of the walls and the vanity. Good thing I have trained my self to take things in stride and I quit biting my nails!